An aqueous solution of an anti-static cationic quaternized polymer is used to deposit the polymer as a soil releasing agent on hard surface, e.g. bathroom porcelain, tiles, etc. in order to provide easier cleaning of the treated surface during subsequent cleaning operation. A preferred polymer is based on recurring units of beta-(trialkyl ammonium) alkyl methacrylate with a molecular weight of from about 5,000 to 50,000 or more. The present invention relates to an aqueous formulation of an anti-soiling recleaning agent for use on common household hard surfaces to impart soil release properties thereto to facilitate subsequent cleaning. The compositions may also include various surface active ingredients and/or disinfecting agents to provide effective cleaning and/or disinfecting of the hard surface being treated. More particularly, certain cationic, anionic or nonionic polymeric soil-releasing agent which is substantive to the treated hard surface is deposited from an aqueous solution, preferably together with various cleaning and/or disinfecting agents for present cleaning/disinfecting, to facilitate removal of subsequently deposited soils, such as soap scum, during cleaning or recleaning of the soiled surface. In our prior application, Serial No. 297,807, filed January 17, 1989, it was reported that aqueous cleaning compositions with certain nonionic surfactants, characterized by their water solubilities and HLB values gave good performance in preventing the adhesion of soap scum on hard household surfaces, such as ceramic tiles, when the tiles are soaked in a 1 % aqueous solution. It was hypothesized that the nonionic surfactant system treatment increased the degree of hydration or water content on the hard surface resulting in preventing tenacious adhesion of the soap scum to the tile surface. The prior application also disclosed that addition of up to 2% of an acid stable cationic or anionic soil release agent enhanced this effect. Example 4 of the prior application demonstrated that incorporation of 2.3% of a 15-20% solution of poly-[beta(methyl diethylammonium) ethylmethacrylate] (poly(MDAEM)) in the mixed nonionic surfactant system aqueous acidic disinfectant composition results in significant improvement of ease of recleaning soiled tiles. The disclosure of our prior application, Serial No. 297,807, is incorporated herein in its entirety by reference thereto. However, the efficacy of the soil release polymers, such as poly(MDAEM), as a hard surface recleaning or anti-soiling agent, is not limited to the acidic aqueous disinfecting cleaning composition of our prior application, or to poly(MDAEM), but appears to a broader range of anionic, cationic and nonionic polymers having certain characteristics, and have utility when used alone, or in the presence of other surfactant systems. In one aspect of the invention, therefore, there is provided a hard surface treating composition for improving the soil removal or anti-soiling characteristics of the treated surface, the composition comprising an aqueous liquid solution or dispersion of a water-soluble cationic, anionic or nonionic polymer which is capable of being adsorbed to the hard surface, and which when applied to the hard surface, leaves a residual anti-soiling polymer layer thereon which increases the hydrophilicity thereof, whereby the hydration of the hard surface from the ambient atmospheric water vapor facilitates removal of soils subsequently deposited thereon, i.e. less work is required to remove the soil than in the absence of the residual layer. In another aspect, the invention provides a hard surface treating composition for cleaning the surface and for improving the soil removal characteristics thereof, the composition comprising an aqueous liquid containing at least one non-soap synthetic surfactant and a soil release promoting water-soluble cationic, anionic or nonionic polymer which is capable of being adsorbed to the hard surface, and which, when absorbed to the hard surface, leaves a residual anti-soiling polymer layer thereon which increases the hydrophilicity thereof, whereby the hydration of said hard surface with ambient atmospheric water vapor facilitates removal of soils subsequently deposited thereon. In still another aspect of the invention, there is provided a method for improving the soil removal property of household hard surfaces which comprises applying to the hard surface an aqueous solution of a soil release promoting water-soluble cationic, anionic or nonionic polymer which will be adsorbed by the hard surface and drying the hard surface whereby said adsorbed polymer forms a residual anti-soiling hydrophilic layer of said soil release promoting polymer on said surface, whereby removal of soils subsequently deposited thereon requires less work than in the absence of said residual layer. According to still another aspect of the invention, there is provided a method for increasing gloss of worn tiles which comprises treating the worn tile with an aqueous solution of a cationic quaternized polymer having a molecular weight in the range of from about 4,000 to 100,000, the polymer being adsorbable to the surface of said tile and, when adsorbed to said tile, increases the hydrophilicity thereof. (3) for soils, such as soap scum, which rely on drying out as part of their mechanism of tenacious adherence, by preventing the soil from drying out. where Ri, R2 and R3, which may be the same or different, are each lower alkyl groups of 1 to 4 carbon atoms, preferably methyl or ethyl. The corresponding acrylates can also be used. More generally, the cationic polymers useful herein include homopolymers of unsaturated amines which are at least partially and preferably wholly (e.g. at least 95%) quaternized with an appropriate counterion. The preferred unsaturated amines are aminoalkyl eaters of acrylic or methacrylic acid, in which the amino group may be substituted by one or two alkyl, alkenyl, aryl, aralkyl or other suitable groups, or by substituents which together with the nitrogen atom form a heterocyclic ring. wherein R1 and R2, which may be the same or different, are hydrogen or alkyl, or together with the nitrogen atom to which they are attached, form a heterocyclic ring; R4 is an alkylene group containing 1 to 8 carbon atoms; and R3 is methyl or hydrogen. Preferably both R1 and R2 are alkyls of 1 to 4 carbon atoms, especially methyl or ethyl. When R1 and R2 together with the nitrogen atom form a heterocyclic ring, the ring may have from 5 to 7 atoms and may include 1 or 2 additional hetero atoms, such as N, S or O in addition to the amine nitrogen atom to which R1 and R2 are bonded. R3 is preferably methyl and R4 preferably has 2 to 4 carbon atoms, and especially preferably is ethylene. where Ri, R2, R3 and R4 are as defined above, R5 is a lower alkyl group of from 1 to 4 carbons, preferably methyl or ethyl, especially methyl, and X- is a monovalent anion or 1/m of an m-valent anion. It is most preferred that at least 50%, preferably at least 80%, more preferably essentially all, i.e. from 95 to 100%, especially preferably 98 to 100% of the repeating units of the polymer have the quaternized form of formula (II). The molecular weight of the polymer is not especially critical so long as the polymer 1) is water-soluble, 2) has some surface activity, and 3) is adsorbed to the hard surface from its aqueous solution in such manner as to increase the hydrophilicity of the surface. In general, however, good results will be obtained with the quaternized cationic polymers having molecular weights in the range of from about 4,000 to 100,000 or higher, preferably from about 5,000 to 50,000, more preferably from about 6,000 to 30,000 and especially preferably from about 12,000 to 26,000. At molecular weights below 4,000, the polymers tend to be too water-soluble to adhere to the hard surface while at molecular weight above about 100,000, especially above 50,000, the polymers tend to be insufficiently water-soluble or are more difficult to process and formulate into stable, pourable formulations. where R6 is as defined above. Other ethylenically unsaturated copolymerizable comonomers, in amounts up to about 20 mol%, preferably up to 10 mol%, can also be included in the anionic polymer if they will not adversely impact on the solubility, adhesion and soil release properties of the polymer. As examples of such copolymerizable comonomers, mention may be made, for example, to unsaturated monocarboxylic acids, such as acrylic acid, methacrylic acid, propionic acid, and the like, unsaturated olefins, such as ethylene, propylene and butene, alkyl esters of the unsaturated carboxylic acids, such as methylacrylate, ethyl acrylate, methyl methacrylate, hydroxy derivatives of these esters, such as, for example, 2-hydroxyethyl methacrylate, unsaturated aromatic compounds, such as styrene, methyl styrene, vinyl styrene, and heterocyclic compounds, such as vinyl pyrrolidone, and others. Of these, hydrophilic comonomers, such as acrylic acid, methacrylic acid, vinyl pyrrolidone, etc., are preferred. Other water-soluble cationic polymers such as, for example, quaternary nitrogen substituted cellulose ethers, for example Polymer JR-30M, can also impart anti-soiling properties. The anionic soil release polymers which can be used in this invention include, for example, the soluble polymeric salts disclosed in U.S. Patent 3,696,043 to Labarge, et al., the disclosure of which is incorporated herein by reference thereto. In particular, soluble polymeric salts may be obtained by neutralizing copolymers of 1 to 2 moles of a monovinyl aromatic monomer per mole of an unsaturated dicarboxylic acid or anhydride there of to form solubilizing salt groups. Preferably the copolymer is an equal molar copolymer. by a simple acid-base reaction where X is a positively charged ion which may be an alkali metal ion such as sodium or potassium, an ammonium ion or a substituted ammonium ion. The neutralization of the anhydride group may be illustrated by the reaction of ammonia with a maleic anhydride copolymer (showing only the anhydride unit of the copolymer). where X is the same as above. An N-substituted half-amide salt is formed when said amine is used in place of the ammonia. By a soluble polymeric salt it is meant to include any of the unsaturated dicarboxylic acid or anhydride copolymer neutralization products which contain a sufficient number of salt groups to render said copolymer soluble in the concentrations employed. It is to be understood that complete neutralization of all the acid groups or anhydride groups may not be required to obtain the desired solubility, however, complete or substantially complete, e.g. at least 95%, neutralization is preferred. Any primary or secondary monoamine may be employed to neutralize the anhydride copolymers provided the amine has no other group reactive with an anhydride and providing it forms a salt group capable of solubilizing the copolymer. While a variety of aliphatic, cycloaliphatic, heterocyclic and like amines may be employed certain amines are preferred from the human toxicity and handling standpoint, since the products are principally intended for use by humans, and from the availability and cost standpoint. The lower alkyl amines such as diethylamine, dimethylamine and the like are frequently used. Alkali metal bases include hydroxides of sodium, potassium, lithium or the corresponding carbonates, bicarbonates, etc. are the most preferred neutralizing agents, especially the sodium salts. Ammonium hydroxide is the usual form of ammonia employed. Any amine may be used provided it forms a carboxylate salt group capable of solubilizing the polymer. Certain amines are preferred for the previously stated reasons. Typical amines for forming substituted ammonium ion-carboxylate salt groups include the mono-, di- and tri-alkyl amines (trimethyl amine, diethylamine, isopropylamine, etc. ); mono-, di- and tri-alkanol amines (triethanolamine, diisopropanolamine, monoethanolamine, etc. ); cycloaliphatic amines such as cyclohexylamine; heterocyclic amines such as morpholine; and like amines. For complete neutralization of the copolymers at least about 2 moles of base per mole unit of dicarboxylic acid or anhydride is required. As indicated complete neutralization is not always needed and in many cases excess base is beneficial. The copolymers themselves and their methods of preparation are well known to the art and need no detailed description herein. Briefly one widely used method is to prepare the polymers by solution polymerization employing a solvent which is a solvent for both the monomers and the polymer. Suitable free radical catalysts such as benzoyl peroxide may be used to initiate the polymerization which can be run over a wide temperature range. The monomers tend to polymerize readily in equal molar proportions. U.S. 3,336,267 discloses how to make non-equal molar copolymers. A variety of other patents disclose methods of polymerization by batch or continuous techniques or to produce low molecular weight or high molecular weight copolymers. It is also taught to employ solvents for the monomer only. Other patents which may be consulted include Re. 23,514; U.S. 2,606,891; U.S. 2,675,370; U.S. 2,838,475; U.S. 2,971,939; U.S. 3,178,395; and U.S 3,418,292. The molecular weight of the copolymers may vary quite widely from about four thousand up to as high as 500,000 or more, so long as the criteria as described above for the cationic polymers are satisfied. Monomers which may be used to prepare the copolymers include unsaturated dicarboxylic acids such as maleic acid, chloromaleic acid, fumaric acid, itaconic acid, citraconic acid, phenylmaleic acid, aconitic acid and the like. Any of the anhydrides of the unsaturated acids may be employed. Aromatic monomers include styrene, alpha-methyl styrene, vinyl toluene, t-butyl styrene and similar well known monomers. 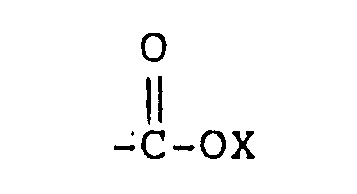 Preferred copolymers are sodium salt of styrene-maleic anhydride or styrene-maleic acid. While the cationic and anionic polymers are preferred, nonionic polymers which adsorb to the hard surface and increase the hydration thereof can also be used. For example, polyvinyl pyrrolidone (PVP), poly(vinyl pyrrolidone-CO-dimethylaminoethyl methacrylate) (also known as polyquaternium II), polyethylene glycols, ethylene oxide polymers, and the like provide anti-soiling benefits to hard surface treated therewith. Conversely, not all water-soluble and adherent or surface-active polymers can provide the desired anti-soiling properties to hard surfaces. For example, silicone-based polymers, fluorocarbon polymers, polyvinyl alcohol, copolymers of methyl vinyl ether and maleic anhydride (i.e. Gantrez AN) and polyacrylates were tested as described below as neat 0.5% wt. aqueous solutions on ceramic tiles but did not confer any anti-soiling benefits or facilitate recleaning. Also, a copolymer vinyl pyrrolidone and vinyl acetate (60/40) did not confer recleaning benefits, thereby showing that whereas PVP homopolymer provides a residual anti-soiling hydrophilic layer, the amount of hydrophobic comonomer is limited to no more than about 25 mol%. As described above, many different types of cationic, anionic and nonionic polymers can be used as the anti-soiling, abhesion promoting agents in this invention. However, the best results have been obtained with the cationic quaternized polymers of formula (II) and especially with poly(MDAEM). Furthermore, as described below, even better performance can be obtained when the cationic polymer is present as its complex with an anionic surface active agent, the amount of the anionic surfactant being sufficiently low such that the complex is also water-soluble and a significant proportion of the quaternized ammonium groups are not complexed. The amount of the soil-releasing agent to promote abhesion is not particularly critical so long as thin residual anti-soiling layer of the polymer remains adhered to the hard surface after the aqueous solution thereof is dried or wiped off. Generally, however, at least, and usually no more than, a monomolecular layer of the polymer is sufficient to exhibit the full anti-soiling effect of the polymer since a monomolecular layer of the polymer should be adequate to form a hydrated water layer on the treated surface. Such monomolecular residual film or coating layer can be achieved with aqueous solutions containing as little as 0.02 weight percent of the soil release polymer, especially for new or unsoiled hard surfaces. A preferred concentration range is from about 0.04 to 5%, more preferably 0.08 to 1 %, by weight of the composition, of the soil release polymer. As used herein and in the appended claims, the expression "less work" in reference to the anti-soiling or recleaning property of the treated hard surface having a residual layer of polymer thereon means that deposited soil can be removed from the treated surface with less scrubbing or wiping when using the same cleaning composition or with a milder cleaning composition and less chemical action than for the same similarly soiled hard surface which has not been treated with a soil-release polymer according to the invention. While the soil release polymers can be used as such to provide easier "next time" cleaning performance, it is generally preferable for the consumer to formulate the soil release polymer recleaning agents together with one or more compatible surface active cleaning agents and/or germicides, as in conventional all-purpose cleaning products or a bathroom or kitchen or general hard surface cleaning compositions, as are well known in this art, including, for example, the germicidal acidic hard surface cleaning compositions of our prior application Serial No. 297,807. Such cleaning compositions have in common the presence of one or more surface active detergent compounds, usually synthetic anionic (non-soap), cationic, nonionic, amphoteric or zwitterionic surfactants. Other common ingredients often present in such types of aqueous cleaning compositions include, for example, detergent builder salts; solvents; acids, bases and pH buffers; germicides, bactericides, and preservatives; thickeners; coloring agents and perfumes; and the like. 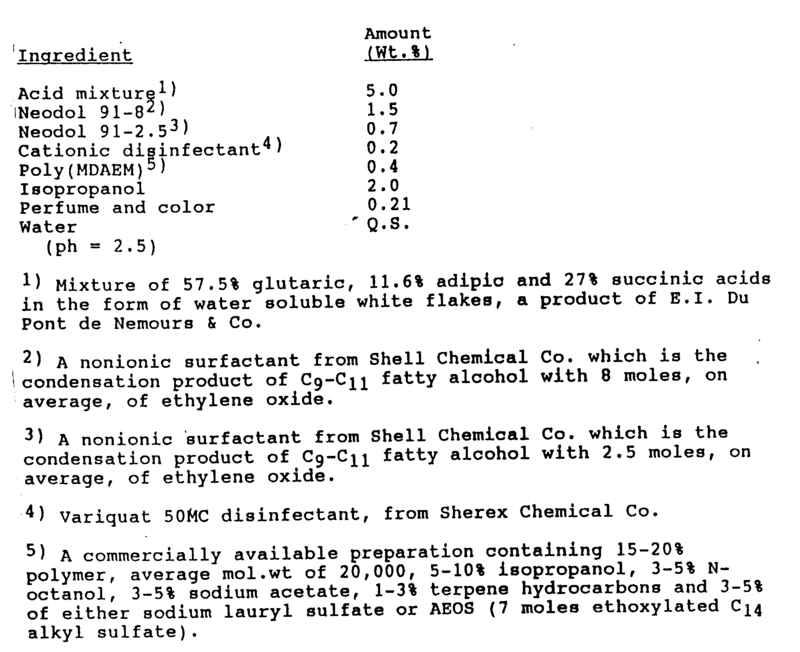 Any of these ingredients which do not interfere with the solubility and adherence of the anti-soiling polymer may be present in the hard surface cleaning and anti-soiling compositions of this invention although it is often preferred to exclude detergent builder salts which are often associated with spotting or streaking of hard surfaces. Organic solvents are often a preferred additive where needed to help solubilize the anti-soiling polymer or any other ingredient present in the composition. For instance, the poly(MDAEM) anti-soiling polymer may often form a slightly hazy aqueous composition and the incorporation of a small amount of isopropanol, for example, or other low molecular weight alcohol, can clarify the composition. Generally, amounts of solvent, when present, will be in the range of from about 0.5 to 5% by weight, preferably about 2% by weight. The polymeric anti-soiling agents will, by themselves, provide a small contribution towards increasing the viscosity of the aqueous compositions, however, in view of the low "solids" concentrations in the typical hard surface treating or combined hard surface treating and cleaning compositions, the viscosities, even with the polymeric additive tend to be as low as about 7 cps or less. Without the polymer or added thickener viscosities of the aqueous composition tend to be less than 5 cps, for example, about 3 cps. For many types of applications, for instance, for treating/cleaning vertical surface, for spray dispensers, and the like, product viscosities in excess of about 10 centipoises, for instance, from about 10 to 100 cps for wipe- on products and from about 10 to 20 cps for spray-on products, are desirable. The increase in viscosity can be accomplished by addition of conventional polymeric thickening agents, such as polyacrylates, guar gum, Irish Moss, carrageenan, polycarboxy vinyl ethers and the like. In selecting the polymeric thickening agent, as well as other additives, the ionic nature of the additive must be taken into consideration. Thus, when the anti-soiling polymer is anionic in nature, then cationic additives should be avoided. Similarly, for a cationic anti-soiling polymer, anionic polymeric thickeners, coloring agents, surfactant (except as discussed below in connection with cationic polymer/anionic complexes), should be avoided. With these caveats in mind, any of the surface active detergent cleaning compounds usually used in hard surface, all purpose or bathroom/kitchen cleaning products, can be used in the present invention. Cationic, amphoteric or zwitterionic surfactant may also be used (except that cationic surfactant should be avoided in combination with anionic soil release polymers) although they are less preferred. Suitable nonionic surfactant detergent cleaning compounds include, but are not limited to those disclosed in our prior application Serial No. 297,807. More generally, mention can be made, for example, of polyethylene oxide and polypropylene oxide ethers of fatty alcohols, fatty acids, fatty amides, alkyl phenols and the like. For instance, the condensation products of fatty alcohols or fatty acids wherein the alkyl group thereof has from 8 to 22 carbon atoms, preferably from 10 to 18 carbons, with from about 1 to 50, preferably from about 3 to 15 moles of ethylene oxide or propylene oxide or mixtures thereof; polyoxyethylene oxide ethers of alkyl phenols, wherein the alkyl has from 6 to 16, preferably 8 to 14 carbon, and the number of repeating ethylene oxide units is from about 6 to 25, preferably from 8 to 15; and the condensation reaction product of ethylene oxide and/or propylene oxide with a C8 to C22 alkyl or C6 to Cs aryl (including alkaryl) amine or amide or (Ci -C6) alkanolamide, can be used as the nonionic surfactant. Suitable surface active anionic detergent cleaning compounds include, for example, the water-soluble salts, especially the alkali metal salts, of sulfates and sulfonates of fatty acids and alcohols and the water-soluble alkali metal salts of the alkyl aryl sulfonates. More specifically, the anionic includes, in the sale form, alkyl sulfates of 8 to 22 carbons, preferably 12 to 18 carbons; alkoxy (polyalkoxy) sulfates wherein the alkyl portion has between 12 and 18 carbon atoms and the alkoxy portion has from 1 to about 10 repeating units, the alkoxy portion most preferably being ethoxy of from 1 to 5 repeating units; alkyl phenoxypolyalkoxy sulfates wherein the alkyl portion has from about 8 to about 16 carbon atoms and the alkoxy portion is selected from the group of ethoxy and propoxy, the number of repeating units thereof being between 1 and 10, the alkoxy portion preferably being ethoxy of 1 to 5 repeating units; sulfonate alkyl and alkylaryl alkoxylates wherein the alkyl portion and the alkoxy portions are as previously set forth for the alkoxy (polyalkoxy) sulfates and alkyl phenoxypolyalkoxy sulfates, respectively; hydroxy alkane sulfonates wherein the alkane is from 12 to 18 carbon atoms; alpha-olefin sulfonates and alkyl benzene sulfonates, especially linear alkyl benzene sulfonates, the alkyl of which has from 10 to 18 carbon atoms; sulfated monoglycerides, and sulfosuccinates, for example, the reaction product of malic acid esters with sodium bisulfate. Most preferably, the anionic surfactant is sodium lauryl sulfate or dodecylbenzene sulfonate. Mixtures of anionic and nonionic surfactants can also be used with anionic anti-soiling polymers and mixtures of cationic and nonionic surfactants can similarly be used with cationic anti-soiling polymers. Amphoteric or zwitterionic surfactants can also be used along or with the anionic, cationic or nonionic surfactants. Of course, for the nonionic anti-soiling polymers any of the types of surfactants may be used. The amount of surfactant which will be included in the composition for cleaning purposes may vary widely depending on the intended use, type of surfactant, other ingredients in the composition, and other factors known in the art. However, for many types of hard surface, all purpose, and bathroom or kitchen cleaning compositions, the total amount of surface active detergent cleaning compounds will usually be in the range of from about 0.1 to 10% by weight, preferably 0.2 to 4% by weight. As noted above, anionic surfactants in combination with cationic soil release polymers form complexes which modify the solubility of the polymer and, depending on the amount, as well as type of the anionic surfactant, these complexes can adversely or beneficially impact on either or both of the adsorption of the polymer to the hard surface and the abhesion performance of the polymer. For any particular cationic soil release polymer, the positive, negative, or neutral impact on adhesion and/or abhesion characteristics can be determined by routine experimentation. The preferred anionic surfactants for complexing with the cationic polymers for improving adhesion and facilitating recleaning are the alkali metal C10 to C18 alkyl sulfates or carboxylates, preferably C12 to C14 alkyl, such as sodium lauryl sulfate, the ethoxylated (2 to 10 moles ethylene oxide) C14 to C20 fatty acid soaps, and the ethoxylated (2 to 10 moles ethylene oxide) C10 to C18 fatty alcohol sulfates, such as sodium stearate condensed with 2 to 10 moles ethylene oxide, and sodium C14 to C16 alkyl ether (2 to 10 moles ethoxylation) sulfate. However, the anionics are not limited to these but also include, for example, the mono and divalent alcohol sulfates and sulfonates, anionic carboxylates, olefin sulfonates, aryl sulfonates and the corresponding ethoxylated anionic surfactants. In general, any of the anionic surfactants mentioned above for the anionic detergent cleaning compound when used in amounts which will not cause the cationic polymer complex to precipitate can be used. Although not wishing to be bound by any particular theory as to why the complexes can often provide further improvements in anti-soiling properties, it is believed that the complex becomes slightly more hydrophobic and can, therefore, more readily deposit on and adhere to the hard surface without changing the orientation of the hydrophilic portion of the polymer with respect to the hard surface. In general, however, based on the experiments conducted by the inventors for poly[MDAEM] (moI.26. approximately 20,000) at a molar ratio of at least 3, and preferably 4 or more, cationic groups in the polymer:1 anionic surfactant head group the best performance for both promoting adhesion and increasing abhesion of soap scum are achieved with the C10 to C14 alkyl sulfate salts, especially sodium lauryl sulfate and moderately ethoxylated (5 to 10 moles ethylene oxide) C12 to C,6, especially C14, alkyl sulfate or alkyl carboxylate. The balance of the novel liquid hard surface anti-soiling/treating or anti-soiling/cleaning composition is water, preferably distilled water, reduced by any optional ingredients which may be present. Generally, the proportion of water in the compositions is about 80% to 94% by weight, preferably 85 to 92% by weight of the composition. Those skilled in the art will readily appreciate that minor amounts of additional ingredients may be optionally present to provide cosmetically appealing products and increase consumer acceptability. Examples of such adjuvants include coloring agents, fragrances, perfumes, viscosifiers, germicides, bactericides, disinfectants, and pH adjusting agents. As the acidic compounds for modifying pH mention can be made of the organic acids, such as lower aliphatic monocarboxylic acids, hydroxycarboxylic acids and dicarboxylic acids. Examples of the aliphatic monocarboxylic and dicarboxylic acids include Ci-Ce alkyl and alkenyl monobasic and dibasic acids, such as glutaric acid, succinic acid, propionic acid, adipic acid, acetic acid and the like. Examples of the hydroxy carboxylic acids include hydroxyacetic acid and citric acid. Mixtures of saturated aliphatic dicarboxylic acids, and especially mixtures of adipic, glutaric and succinic acids are commercially available and are conveniently used. These mixtures are described in greater detail in our prior application Serial No. 297,807. Of course, inorganic acids, such as HCI, HN03, H2S04, can also be used, but usually in combination with organic acids, or appropriately diluted. Similarly, organic and inorganic bases, such as ammonia, ammonium hydroxide and various amines, amides and alkanolamines and alkanolamides, can also be added to raise the pH were necessary or desired to formulate less acidic or more alkaline formulations. In this regard, it is well understood by the practitioner that product pH not only affects cleaning performance against specific soil types, but that the pH will also have an affect on the form and stability of the cationic or anionic soil abhesion promoting polymers. It is also well understood that the choice and selection of the surfactant component and other optional additives, such as, coloring agents, thickening agents (viscosifiers) and the like will be made in consideration of the ionic nature of the anti-soiling polymer. It should also be apparent to those of ordinary skill in the art that when, for example, a cationic germicidal or surfactant compound is to be included in the composition, the complex of the cationic anti-soiling polymer with the anionic surface active agent should be formed out of the presence of the cationic compound since, otherwise, the cationic compound and anionic compound may form a complex rather than the desired anionic surfactant-cationic polymer complex. For example, for the preferred cationic polymers, anionic surfactants, except as described above, and anionic coloring agents or thickening agents, and other anionic additives should be avoided since they tend to form insoluble complexes with the cationic polymer. Anionic surfactant concentrations in cationic polymer embodiments should, in any case, be limited to about 0.25% by weight, while anionic polymer thickening agents or other anionic polymers should be altogether avoided. In addition to the improvement in facilitating recleaning of surfaces treated with the compositions of this invention, it has been surprisingly discovered that the appearance (gloss) of damaged ceramic tiles or similar household hard surfaces, e.g. porcelains, to which the compositions of this invention are applied can be improved (e.g. gloss readings are increased) as compared to tiles treated with the same compositions, excluding the cationic polymer. For example, an acidic (pH=2.5) aqueous composition containing 0.4 weight percent of poly[MDAEM] of 20,000 molecular weight complexed with C14 alkyl sulfate condensed with 7 moles ethylene oxide when applied in a laboratory test to a ceramic tile etched for 15 minutes by immersion in a 1.3% HF bath (such that the gloss is reduced from an initial value of 90 to a value between 30 and 50 - simulating older tiles washed with abrasive cleaners for several years) improves the gloss of the surface by 1 gloss unit when measured with a Gardner 20 gloss meter. Even more significant, however, is that in consumer panel tests, almost all of the panelists indicated that they attribute higher shine to the tiles treated with the invention compositions. The appearance of higher shine is most pronounced with acidic treating compositions, presumably because the acid treatment itself provides better soap scum removal and cleaning. However, even at pH values of about 6 or more, the panelists still report a higher shine for tiles treated with the compositions of the invention. In comparison, when the same tiles are treated with a similar composition but without the poly-[MDAEM], no differences in gloss are measured. This effect on surface appearance is only observed for worn tiles, that is, gloss differences are not measured after treating a new tile surface. However, recleaning performance is obtained on both new and old tiles and other hard surfaces. The anti-soiling performance of the composition is tested on each of a new white ceramic tile and of a soap scum soiled new or etched white ceramic tile. One-half of the new tile is immersed and the other half is immersed in the same formulation but without the poly(MDAEM). After removal from the bath, the tile is gently wiped dry with a soft paper towel. The soap scum soiled tiles are prepared by spraying the tiles with a 250 g/I solution of CaCb. H20 followed by a red dyed 5% sodium oleate solution. The tiles are allowed to dry for one hour at 30°C and the soiling procedure is repeated. The soil so produced is uniform and reproducible within accepted limits. 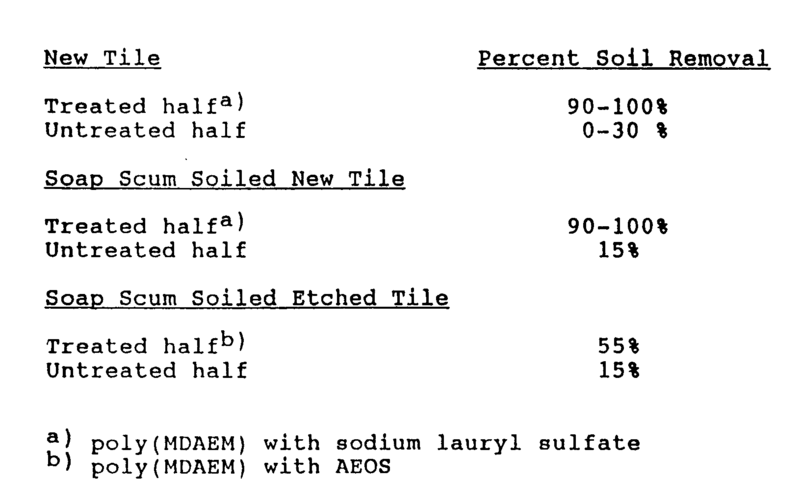 One-half of each soap scum soiled tile is cleaned with the invention composition described above and the other half is cleaned with the same composition excluding the poly(MDAEM). The tiles are cleaned by hand until all the soap scum is removed. After the treatment of the new or soiled tiles with the cleaning composition with or without the anti-soiling polymer the tiles are rinsed and air-dried and the entire tile surface is re-soiled with soap scum by the same procedure as described above. The re-soiled tile is then washed with a mild cleaning consisting of a 1% aqueous solution of a 1:1 w/w mixture of Neodol 91-6/Neodol 91-2.5. This mild cleaning solution will provide a minimum amount of chemical cleaning action. The tiles are cleaned according to Standard Practice Instruction 8173 using the mild cleaner and 10 cycles on a Gardner Abrasion Tester. In this test, the tiles are mounted in the Tester equipped with two cellulose sponges measuring 5 cm x 5 cm x 5 cm. Three grams of the mild cleaner are pipetted onto the sponges wetted with 5 gm water. A reflectometer is used to measure the reflectance before and after the 10 abrader cycles and the percent soil removal is determined. The results are shown in the following table. When the above test is repeated by treating the tiles with a similar composition according to the invention except that the pH is increased to 6 by addition of sodium hydroxide, the tile-half treated with the poly(MDAEM)-AEOS containing composition, gave 100% soil removal after 5 cycles on the Gardner Abrasion tester using the same mild cleaning solution whereas the untreated tile gave 55% soil removal. After recleaning with the same mild cleaning composition as in Example 1, the untreated side showed essentially no cleaning (<10% soil removal) whereas the poly(MDAEM) treated side showed an average of 90% soil removal. This example demonstrates that the treating compositions of this invention can be applied to various types of hard surfaces commonly found in the home. The same test as described in Example 1 is carried out on unsoiled polymethacrylate test plates, except that only 5 cycles are applied on the Gardner Abrasion tester using the same mild cleaner as used in Example 1. The average soil removal on the poly(MDAEM) treated side is 66% and on the untreated side is 45%. No significant difference in the shine or gloss of the surface is observed. The test procedure of Example 1 is repeated on new white ceramic tiles treated with neat 0.5% aqueous solutions of either poly(MDAEM) or the following polymers: polyvinyl pyrrolidone (avg. mol. 26. 360,000); Gafquat 755N (vinyl pyrrolidone/dimethylaminoethylmethacrylate copolymer, polyquaternium II), Polymer JR-30M (a quaternary nitrogen substituted cellulose ether, where 30M is the designation of viscosity at 1% concentration, sodium salt of styrene-maleic anhydride copolymer, Sokalan (CP7) (sodium salt of copolymer of methacrylic acid and maleic anhydride), polyethylene terephthalate/polyethylene oxide terephthalate copolymer, and polyethylene oxide (mol. wt. 4,000,000). The best recleaning performance (least amount of work required for given soil removal or most soil removal for a given amount of work) was provided by the poly(MDAEM) treated surface, with lesser improvements in the order given (from good to adequate) for the remaining polymers. Accordingly, it can be appreciated that the present invention provides a composition and method for treating hard surfaces, such as ceramic tiles, porcelain, enamel, Formica, polymethacrylates, and the like, such as found in bathrooms (sinks, tubs, shower stalls, walls, floors, vanities, etc. ), whereby the treated surface is modified to increase its hydrophilicity, with or without simultaneous cleaning of existing soil. As a result of this treatment any further soiling becomes easier to clean during subsequent cleaning (with the same or different cleaning solution) because the built-up soil will not adhere as tenaciously to the treated surface as it would to the same surface which has not been treated with an anti-soiling polymer according to the invention. It should be noted that the performance of the soil release polymer containing compositions of this invention is dependent on the prevailing humidity of the ambient atmosphere: if there is little moisture in the air the degree of hydration of the treated surface becomes insufficient to adequately prevent soil adhesion by whichever of the above proposed theories or other mechanism is in operation. Generally, humidity levels of at least about 35% RH at 70 F will provide the best results upon subsequent recleaning. For most areas of application, such as bathrooms and kitchens, the prevailing atmospheric moisture levels will be equivalent to at least 35% RH. It should also be understood that the treating compositions of this invention are not limited to household hard surfaces but can also be used to facilitate recleaning for other types of hard surfaces, such as automobiles (e.g. vinyls, metals, painted surfaces, etc. ), window casements and the like. In final form, the aqueous liquid hard surface modifying compositions, including the treating and cleaning compositions are typically homogeneous compositions which exhibit stability at both reduced and increased temperatures. More specifically, such compositions remain stable in the range of 5°C to 40°C. The liquids are readily pourable and free flowing from any suitable container or may be sprayed from a pump-type sprayer. Another advantage of the compositions of this invention is that by virtue of the increase in viscosity from the polymer anti-soiling agent, especially the cationic polymer-anionic surfactant complex, the products can be formulated with viscosities between about 10 to 20 cps which allows the products to be sprayed with most conventional pump spray nozzles with substantially less misting than for lower viscosities but without clogging the spray nozzle as would tend to occur with higher viscosities. The compositions are directly ready for use. Only minimal rinsing is needed and substantially no residue or streaks are left behind on the cleaned surface. Because the preferred compositions are free of detergent builders, such as alkali metal polyphosphates they provide a better "shine", i.e. less streaking, on cleaned hard surfaces. Typically, the inventive compositions are prepared simply by combining all of the ingredients in a suitable mixing vessel or container. Generally, the various ingredients can be added sequentially, or all at once, to form an aqueous solution of each or all of the essential ingredients, care being taken to avoid mixing together any anionic and cationic components as described previously. Preferably, when a fragrance is present, the fragrance is first dissolved in a water dispersible nonionic surfactant which is then added to the other ingredients in aqueous acid solution. When the surfactant/fragrance mixture is added to the aqueous acid solution containing the remaining ingredients, the solution may become slightly hazy. If a cationic disinfectant compound is added to the aqueous mixture, the fragrance becomes completely solubilized and the final mixture is clear as well as stable. Additional base may then be added, if desired, to increase product pH. The compositions may be prepared at room temperature. In use, the compositions of this invention are applied to the surfaces to be modified/cleaned with a cloth or sponge or by spraying onto ceramic or other surfaces which may have been soiled by accumulations of insoluble soaps, mineral deposits, and oily soils. The compositions, without added thickeners, other than the soil-releasing polymer, are of somewhat higher viscosity than water, generally up to about 3-10 cps or higher, the polymer complexes providing higher viscosity in general. The material will usually be allowed to remain on the surface to be modified for a period from 10 seconds to 5 or 10 minutes, but preferably such contact time will be from about 30 seconds to five minutes or from 1 to 3 minutes. The liquid composition may then be removed either by wiping or rinsing with water. Depending on the degree of soiling of a hard surface not previously treated with the invention composition more or less strenuous wiping and rinsing may be required. However, in all cases subsequent recleaning requires substantially less work to remove any subsequently deposited soils. These compositions leave substantially no spots or streaks whether or not they are rinsed from the cleaned surface. The foregoing description and specific examples are intended merely as illustrations of specific and preferred embodiments for the practice of the invention. It is to be understood, however, that other expedients known to those skilled in the art or disclosed herein may be employed without departing from the spirit of the invention or scope of the appended claims. 1. A hard surface modifying composition for increasing the hydrophilic nature thereof to thereby facilitate removal of soils deposited thereon, said composition comprising an aqueous solution of an anti-soiling water-soluble anionic, cationic or nonionic polymer, said polymer being adsorbed on said hard surface from said aqueous solution and forming a residual anti-soiling polymer layer thereon, said residual layer being hydrophilic and capable of attracting atmospheric water vapor thereto, whereby soil deposited on said residual layer in the presence of atmospheric water vapor can be removed from said surface with less work than in the absence of said residual layer. 2. The hard surface modifying composition of claim 1 wherein said anti-soiling polymer is a cationic polymer at least 50 mole% of the repeating units of which comprise quaternized ammonium alkyl methacrylate groups. R5 is a monovalent anion or 1/m of an m-valent anion. 4. The hard surface modifying composition of claim 3 wherein R1 and R2 are, independently, methyl or ethyl, R3 is methyl, R4 is ethyl and R5 is methyl. 5. The hard surface modifying composition of claim 1 wherein said anti-soiling polymer is an anionic copolymer salt of a monovinyl aromatic monomer and an unsaturated dicarboxylic acid or anhydride thereof. 6. The hard surface modifying composition of claim 3 wherein said cationic polymer is present as a water-soluble complex with an anionic surfactant at a molar ratio of the quaternized ammonium groups to the anionic surfactant of at least about 3:1. 7. The hard surface modifying composition of claim 6 wherein the molar ratio of quaternized ammonium groups to anionic surfactant is from about 3.5:1 to 6:1. 8. The hard surface modifying composition of claim 6 wherein said anionic surfactant is selected from the group consisting of alkali metal alkyl sulfate wherein the alkyl group has from about 10 to 16 carbon atoms, a C12 2 to C18 alcohol sulfate ethoxylated with from about 2 to 7 moles ethylene oxide per mole of the alcohol, and an alkali metal C16 to C20 fatty acid soap ethoxylated with from about 2 to 7 moles ethylene oxide per mole of fatty acid. 9. A hard surface modifying and cleaning composition comprising an aqueous solution of non-soap synthetic surface active detergent compound and a surface modifying anti-soiling water-soluble polymer which is adsorbed from said solution by said hard surface and which when adsorbed by said hard surface forms a residual anti-soiling polymer layer which increases the hydrophilic property thereof, whereby said surface becomes capable of attracting atmospheric water vapor thereto, such that when said composition is applied to a soiled hard surface the soil can be cleaned with the assistance of the surface active detergent compound and a residual anti-soiling polymer layer is formed said hard surface such that soil subsequently deposited on said surface can be removed therefrom with less work than in the absence of said residual layer. 10. The hard surface modifying and cleaning composition of claim 9 wherein said surface active detergent compound comprises at least one nonionic surface active compound and said anti-soiling polymer comprises a quaternized cationic polymer. 11. The hard surface modifying and cleaning composition of claim 10 wherein said quaternized cationic polymer is present as a water-soluble complex with a minor amount of an anionic surfactant compound. 13. The hard surface modifying and cleaning composition of claim 12 wherein the water-soluble complex comprises at least about 3 moles of the group of formula (II) for each mole of the anionic surfactant. 14. The hard surface modifying and treating composition of claim 13 wherein said anionic surfactant is selected from the group consisting of alkali metal alkyl sulfate wherein the alkyl group has from about 10 to 16 carbon atoms, a C12 to C18 alcohol sulfate ethoxylated with from about 2 to 7 moles ethylene oxide per mole of the alcohol, and an alkali metal C16 to C20 fatty acid soap ethoxylated with from about 2 to 7 moles ethylene oxide per mole of fatty acid. 16. The hard surface modifying and treating composition of claim 15 having a pH in the range of from about 2 to 9. (e) the balance water, said liquid cleaning composition having a pH of about 2-9. 18. The composition according to claim 17 comprising 0.06-1 % of said water-soluble polymer soil releasing agent selected from the group consisting of poly(beta trialkyl ammonium ethyl methacrylates) having ethyl or methyl groups attached to the ammonium moiety. 19. A method for modifying the hydrophilic properties of a household hard surface to facilitate removal of soil deposited thereon, said method comprising contacting the hard surface to be modified with an aqueous solution of an anti-soiling water-soluble cationic, anionic or nonionic polymer which will be adsorbed by said hard surface, and drying said hard surface whereby said adsorbed polymer forms a residual anti-soiling hydrophilic layer on said surface, whereby soil deposited on said residual layer can be removed therefrom with less work than in the absence of said residual layer. 20. The method of claim 19 for treating ceramic, enamel or porcelain hard surfaces. 21. The method of claim 19 wherein said aqueous solution further comprises a detersive amount of an anionic, cationic or nonionic surface active detergent compound, with the proviso that said detergent compound is cationic or nonionic or both when said polymer is cationic, and said detergent compound is anionic or nonionic or both when said polymer is anionic. 22. The method of claim 21 wherein said polymer is cationic, said surface active detergent compound is nonionic and said cationic polymer is present as a water-soluble complex with a minor amount of an anionic surfactant compound in an amount of no more than one mole of anionic surfactant for each 3 moles of cationic group in said cationic polymer. GR1001375B (en) * 1991-09-06 1993-10-29 Colgate Palmolive Co Acidic disinfectant all-purpose liquid cleaning composition. EP0635567A3 (en) * 1993-07-23 1996-11-27 Kodak Ltd Method and composition for facilitating the removal of soil contaminants from solid surfaces.